The image shows the amoeba Dictyostelium discoideum (in grey) infected by the bacterium Mycobacterium marinum (in indigo). 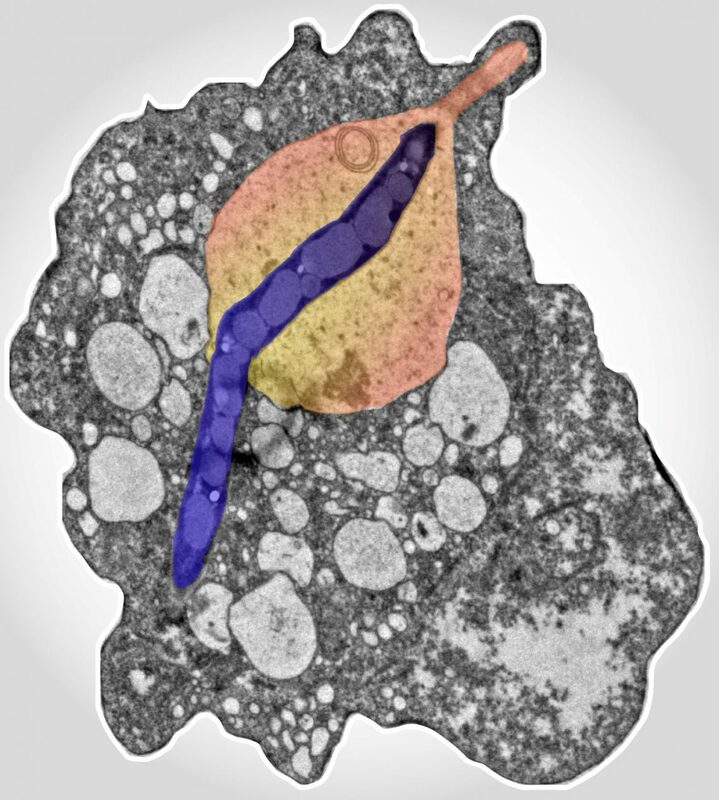 The bacterium was caught escaping from the compartment (in peach) into the cytosol of the amoeba. The picture was taken by electron microscopy and it was artificially coloured afterwards. Image courtesy Elena Cardenal-Muñoz. Tuberculosis is one of the most severe infectious diseases in the world, responsible for more than 1.5 million deaths every year (1). The cause of this disease is the lung infection generated by the bacterium Mycobacterium tuberculosis (Mtb), which escapes the confinement created by our immune system to replicate and disseminate. A recent study from the University of Geneva, Switzerland, claims that assisting Mtb in its escape might actually help the macrophages fight the infection (2). During bacterial infections, immune phagocytes recognize and swallow the pathogenic intruders, trapping them inside membranous “walled” compartments. Acting like cruel guards, the immune cells remove nutrients from these “jails” and deliver toxic compounds, eventually killing the prisoner bacteria. But Mtb is armed. This bacterium carries a weapon capable of perforating the confining compartment walls to escape into the less hostile cytosol of the immune cell (see Figure). There, mycobacteria gain easier access to nutrients, an essential process to ensure growth and dissemination to neighboring cells. This cycle of growth and spreading finally produces the tuberculosis disease. Fortunately, the immune system of healthy, non-immunocompromised people can avoid the replication and dissemination of the bacteria by activating a defense mechanism called “xenophagy.” This “eating the foreigner” process allows the macrophage to recapture the Mtb escapees into reinforced compartments made of double membrane walls, permanently incapacitating the bacteria. Problems arise when Mtb infects an immunocompromised person whose immune system cannot fight the replicating bacteria or, even worse, when a person is infected with an antibiotic-resistant Mtb. Due to the inappropriate use of antibiotics, Mtb is developing resistance to drugs that were successfully tackling tuberculosis before. To address this problem, scientists are seeking a new strategy. Instead of researching new bacteria-killing drugs, to which Mtb again rapidly develops resistance, one can try to render our immune system more aggressive against those bacteria. Swiss researchers have discovered a putative target for such a “defense-boosting” strategy. The group of Prof. Thierry Soldati proposes to interfere with a protein machinery called ESCRT (from endosomal sorting complexes required for transport) in order to strengthen the fight against tuberculosis. Dr. López-Jiménez, an author of the study, discovered that infected cells can sense perforations of their walls induced by escaping mycobacteria, and how these cells use the ESCRT machinery to repair the holes and retain the escapees inside the resealed compartment. These scientists noted that incapacitating the ESCRT machinery facilitated the escape but at the same time improved the attack by xenophagy, resulting in more efficient control of the recaptured bacteria. What renders this study even more captivating is the laboratory model of tuberculosis used by the researchers. Instead of observing these processes inside an infected macrophage, they used another natural voracious phagocyte, the soil amoeba Dictyostelium discoideum. This amoeba has properties similar to human immune cells and can be infected with Mycobacterium marinum (Mmar), a close relative of Mtb. Mmar normally causes a tuberculosis-like disease in fish and frogs, and its danger to humans is very limited. This makes Mmar a friendlier object of research than its deadly cousin Mtb. In addition, because such infection and defense processes are conserved during evolution, this amoeba has become a useful tool for microbiologists to study infectious diseases. The ESCRT machinery had recently been involved in the repair of membrane damage, but this is the first detailed report of the role of ESCRT in containing bacterial infections. This work opens the door to investigate new drugs that do not directly combat Mtb, or bacteria with similar escape strategies but boost the cellular defense systems of the patient to fight the infection, a treatment that would not be accompanied by the development of antibiotic resistance. These findings are described in the article entitled The ESCRT and autophagy machineries cooperate to repair ESX-1-dependent damage at the Mycobacterium-containing vacuole but have opposite impact on containing the infection, recently published in the journal PLOS Pathogens. World Health Organization (2018). Global Tuberculosis Report 2018 Available online at https://wwwwhoint/tb/publications/global_report/en/. Lopez-Jimenez AT, Cardenal-Munoz E, Leuba F, Gerstenmaier L, Barisch C, Hagedorn M, et al. The ESCRT and autophagy machineries cooperate to repair ESX-1-dependent damage at the Mycobacterium-containing vacuole but have opposite impact on containing the infection. PLoS Pathog. 2018;14(12):e1007501. Elena Cardenal-Muñoz is a Scientific Collaborator at the laboratory of Prof. Thierry Soldati in Geneva, Switzerland, where she studies the molecular mechanisms of innate immunity against pathogenic mycobacteria. Elena also works for the non-profit organization Life Sciences Switzerland (LS2) and is involved in various science communication projects.